Angkaliya's paintings combine a scattering of animals, plants and people drawn with finely detailed line work often painted with a punu (wooden stick). 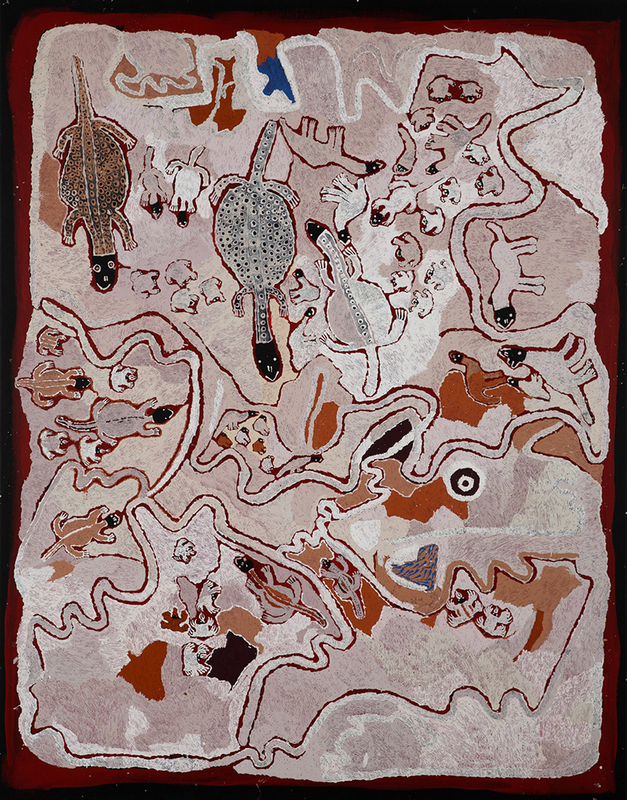 The representation of rockholes, creeks and other topographical elements are interspersed with people and animals going about their daily activities. She paints at Tjungu Palya art centre. Ngayuku mitaku ngurangka (this is my country from my husband), a place called Cave Hill. There are many animals living in this desert country and their tracks are everywhere. There is a lot of water here too, it’s a precious place. My husband Billynya and I travelled on a camel from the mission in Ernabella to Cave Hill. Angkaliya Curtis was born at Miti in the Anangu Pitjatjantjara Yunkuyjatjara Lands. Angkaliya lived a semi nomadic lifestyle, often walking long distances in the desert where traditional knowledge of the country, its water holes and food supplies are vital to survival. She learned the secrets of the land from her mother and grandmother and acquired an intimate understanding of the environment and the ancestral creation stories associated with it.